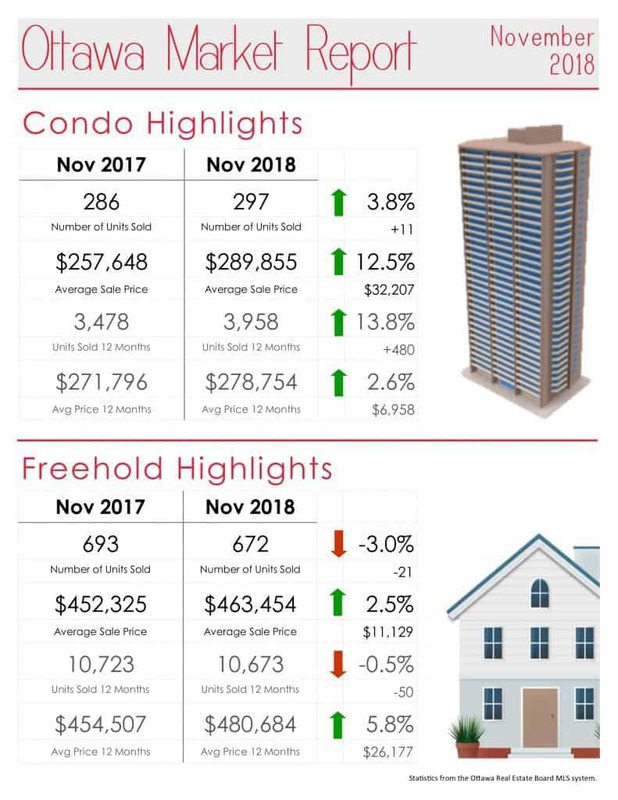 November has been another good month for real estate resales in Ottawa. Condos in particular have done very well. Number of sales was 3.8% higher this November compared to 2017, and the price was up 12.5%. Sales for the 12 months ending November were way up – almost 14% more than the 12 months ended last November but the prices were up only 2.6% year to date – still that is much better than the last few years (since 2012) which had no increase in price and actually decreased a couple of those years. Freehold properties had a great price increase of about 2.5% November over November, and 5.8% for the previous 12 months. The number of sales was down, which is a reflection of not enough properties available for the buyers who are looking. December and early January usually slow down as people are busy with family and holidays. Hopefully the new year brings a more balanced market for all the buyers who are looking for new homes.